Invasive species are "expats" that have created successful populations in and in turn adversely affect the foreign habitat they colonize. The North American native slipper limpet, Crepdiula onyx, is one such species found in Asia. A group of scientists at the Chan Lab of the Division of Life Science, HKUST, uses this species as a model organism to test if these invaders are also "immune" to an emergent pollutant: microplastics. These <5mm plastic pieces are of increasing concerns as it account for over 90% of floating plastic in the ocean. The group reported that the snails growth and development were unaffected by the presence of microplastics at environmentally relevant concentration —suggesting that these little invaders may further threaten other marine organisms that are less resilient. Their findings were published in the journal Environmental Pollution in Feb 2018. "Microplastics exposure could be detrimental to marine organisms especially under high concentrations," said Abby Lo Hau Kwan, Ph.D. student at the Division of Life Science, HKUST, and co-author of the paper. 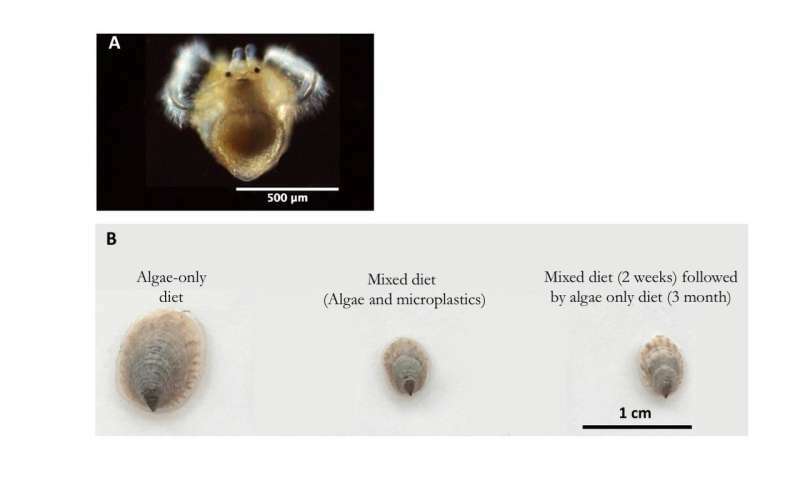 "In our two-stage experiment, we first exposed Crepidula onyx to additions of algae-sized micro-polystyrene (micro-PS) beads at different concentrations, including ones that were comparable their algal diet. We then halted or continued after settlement and continued to measure the impact of microplastics in the snails."